The Office of Rail Regulation analyses the income and operating cost for the franchised train operators and has calculated that for the 2013/14 financial year margins declined to 1.9% on an overall turnover of £8.9 billion. These very small margins leave no room for error in the delivery of bid assumptions and franchise owners can rely on FCP experience to offer remedies if gaps appear in expected outcomes. A new franchised operator has already found the financial going difficult. 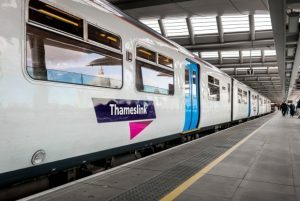 Govia took over operations of the Thameslink franchise from First Group in mid-September 2014 and has already announced that the management fee of £126.5 million paid for the period to the end of the year has been absorbed by the cost of operations. This contract structure reflects uncertainties about the level of revenue during a period of major re-construction but in the same period the DfT retained £48.7 million of fare box revenue paid by passengers in excess of the management fee. There has been a continuing overall decline in the net figure for support payments which have reduced to £134 million in 2013/14 but this hides an increasing disparity between profitable operations where premium payments are made and those where there is a shortfall in fare box income. Train Operating Companies in London and South East are the most profitable group with Southern earning a 3.2% margin (£25 million) on revenue of £770 million while paying the DfT a premium of £153 million. The highest premium was paid by South West Trains at £297 million and as a result a wafer thin margin of 1.6% (£16 million) was produced on a turnover of £961 million. In all premiums paid by nine TOC’s totalled £1,208 million which funded the large losses incurred by regional operations headed by Scotrail where support payments totalled £506 million, Northern £306 million and Wales & Borders £152 million. The premiums paid by longer distance operators were headed by the Government owned East Coast TOC where £217 million was paid which represented the operating surplus on a turnover of £717 million. In comparison the Virgins Trains West Coast franchise reported a profit of £7million on a turnover of £954 million after making a premium payment of £97 million. East Coast has had a stronger financial performance as it is operating an elderly fleet of trains with lower capital costs that are due to be replaced from 2018 by new Hitachi built Super Express rolling stock. The franchise is returning to the private sector from 1st March 2015 as a result of a successful tender from a consortium made up of Stagecoach (90%) and Virgin (10%). The trains are to be branded as Virgin East Coast and premium payments are due to increase sharply despite the cost of new rolling stock with payments to the DfT rising progressively to reach £645 million in 2023; the total payments over the 8-year contract are £2.3 billion based on an expectation that revenue will double in that period.